The classic San Francisco omelet could easily be replicated here in Houston. Bacon and fried oysters in an omelet: the Hangtown Fry could almost have been invented here in Houston. One of my favorite scenes in L.A. Story is set in a restaurant toward the beginning of the movie. (No, not L'Idiot; that's later in the film.) Sara, a British newcomer to Los Angeles, joins her new friends for lunch, asking as everyone settles in: "What sort of food is this?" The group answers in unison: "California cuisine!" This means nothing to Sara. To most other Americans, however, California cuisine evokes ideas of sprouts and avocados, of quinoa and kale. I was pleased to find much more than this during a recent trip to San Francisco, however. It's not that I was surprised, mind you. San Francisco is one of the greatest places on earth to visit if you're into food. 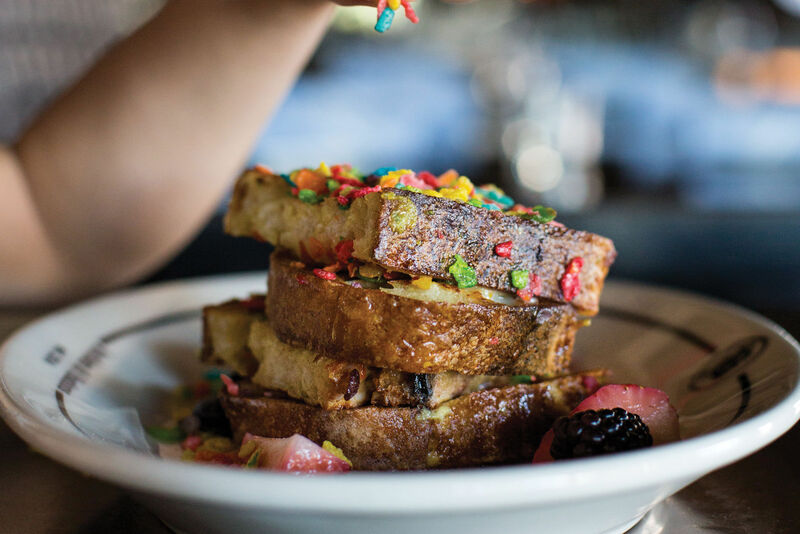 The wide variety of influences that meet in the port city combined with its proximity to some of the best produce and seafood in the country—all knit together economically by booming tech and tourism economies that afford restaurants the ability to offer extraordinary dining experiences—makes the town a natural fit for food lovers. As such, you'll find something for everyone in San Francisco, whether you're into multi-course tasting menus at Saison or divey diners in Dogpatch. I'm personally more inclined toward the latter, which is where I encountered my very first Hangtown Fry at Just For You Cafe. 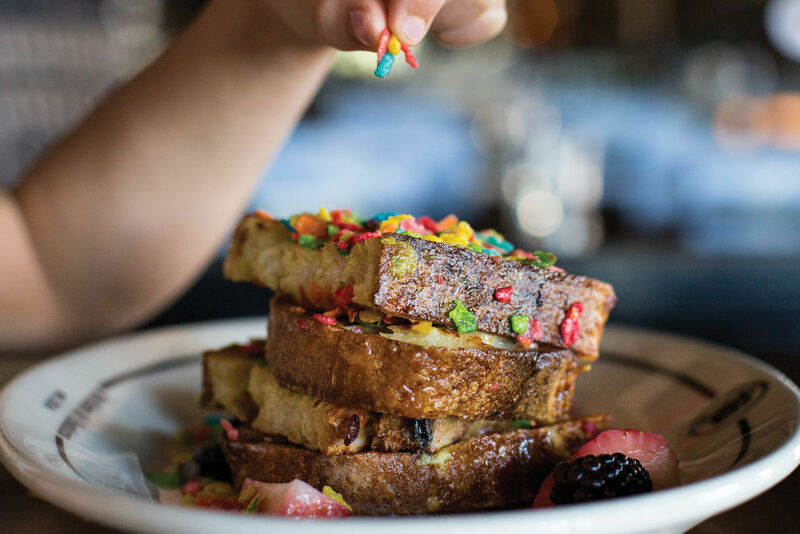 The cafe itself will celebrate its 25th anniversary next year, while the Hangtown Fry can trace its roots back at least 160 years. This classic California dish is anything but stereotypical "California cuisine," however. The Hangtown Fry combines bacon, eggs, and fried oysters into one magical breakfast dish that's said to be the ultimate hangover cure. It's also a dish that would no doubt be equally successful in Texas if it ever made it over the Rocky Mountains. 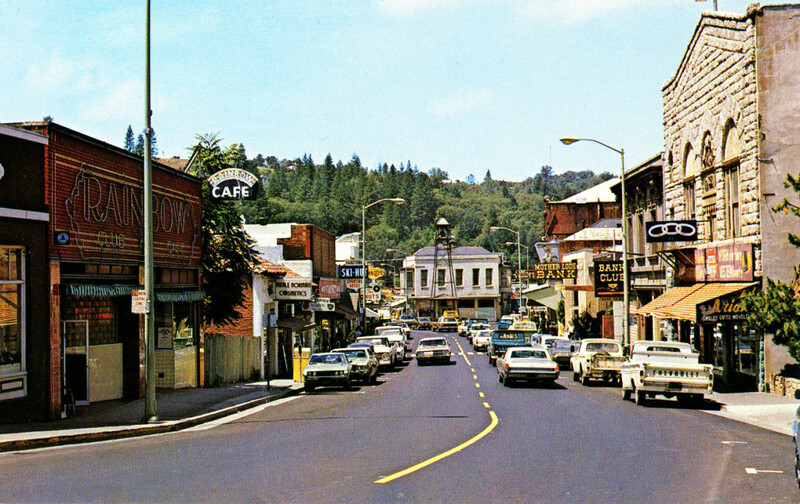 Placerville, California was originally known as Hangtown. The most expensive things on the menu are eggs, bacon and oysters. The eggs have to be carefully packed to travel the rough road from over the coast; the bacon comes by ship round the horn from back east; and the fresh oysters we have to bring up each day on ice from the cold waters of San Francisco Bay. Take your choice. I can cook you anything you want, but it will cost you more than just a pinch of that gold dust you have there. Whether the story is true or not doesn't matter; the Hangtown Fry has become synonymous with San Francisco and Northern California thanks to years spent on menus at places like Tadich Grill, where the dish has been on the menu at the Financial District mainstay—the oldest continually operating restaurant in the city—for a reported 160 years. 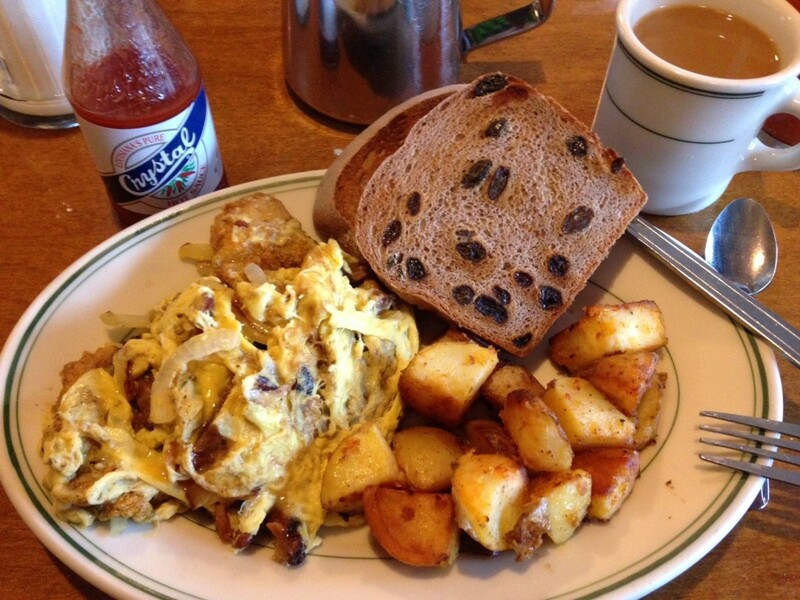 Over time, the dish spread to other restaurants throughout the city, where each has its own version of the omelet. 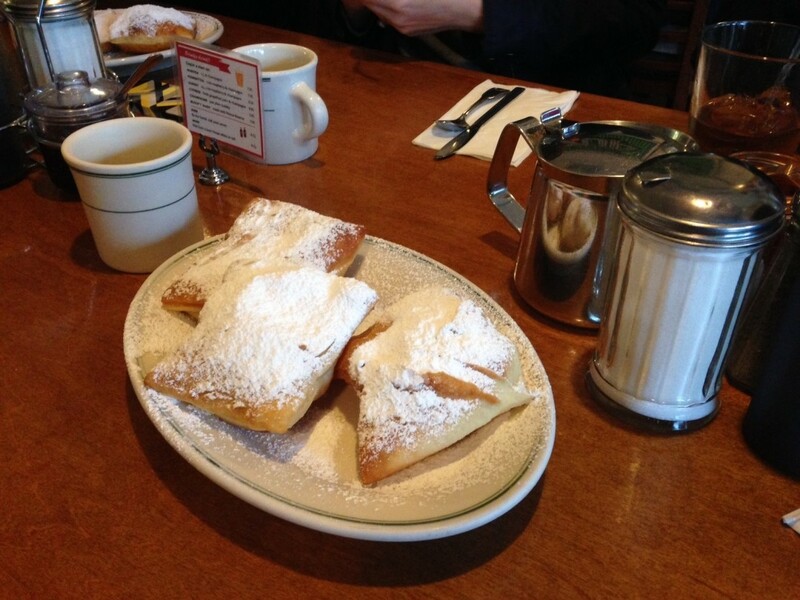 Beignets at Just For You Cafe are the perfect accompaniment to a Hangotwn Fry. At Just For You Cafe, there's a decidedly Cajun twist woven in amongst the other influences (Filipino longanisa sausage is served with one breakfast dish, while your Bloody Mary is made with Korean soju in lieu of vodka). I had my Hangtown Fry with freshly fried and sugared beignets, topped the bacon-and-oyster-filled omelet with some vigorous splashes of Crystal hot sauce, and marveled at how the entire breakfast would be right at home in Houston—how it transcended the prototypical California cuisine. Or did it? In a panel last year, food truck czar Roy Choi told an audience how California cuisine is still evolving—how it no longer means pretentious-sounding health food, how younger chefs are still embracing California cuisine and updating the movement as they do by looking to all the influences available in the vast state. 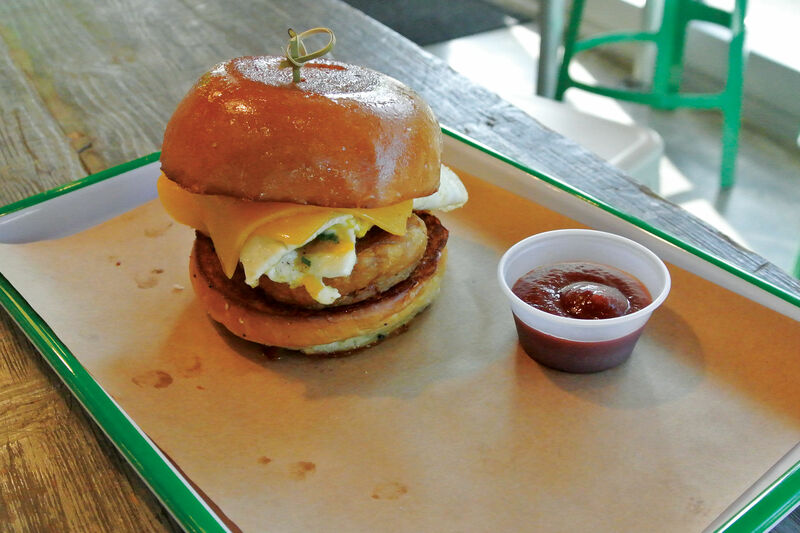 This should sound familiar to Houstonians—as familiar as a Hangtown Fry, despite its entirely un-Texan roots. "We’re a land of discovery," said Choi. "We’re not chained to any form of history or a past. We chill like that."